Yes! MaryClare does beautiful work.!!!!! Keep it up! You are an inspiration!! hello, the hunted mansion really a eye full...keep it up it' been a beautyful ride captivating ,intreging,and lot of fun. it's not just old fashioned ,and the good time's:but a sitll cool feeling of the yester year in fact still a strong overwhelming sense of freedom. i really love this layout for the haunted house. Mary Clare is Watertown's Martha Stewart!!! Passing by this incredible gingerbread house everyday at Halloween was sheer torture...I wanted to be a "monster" and eat it yet hated to see it disappear! I worked with MaryClare when she worked in Watertown. She also made Christmas Gingergread House's for each department that were also AWESOME. She does wonderful work! I'm glad some other folks can appreciate her work! Definitely a 5 Star project! Absolutely beautiful. Thank you for your great comments. I was the Children's Librarian @ Watertown Free Public Library and I made it. WOW!!! I never thought to come across it.... Thank you Esmerelde for putting the photo in. How long did it take? 2 days for baking and making the pieces and then prolly a weekend to complete the house. It's pretty cool and lots of great tips. Have fun.... I am hosting a gingerbread house making event for my peeps.... should be alot of fun! this cake need a ten star rating. 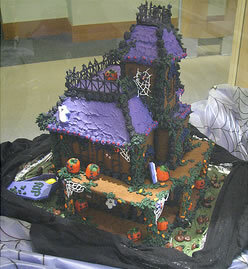 I love it, it creates that spookyness halloween is all about and it also looks edible. I just want it lol. Tell me, how long did it take to make that cake? Join in and write your own page! It's easy to do. How? Simply click here to return to Haunted Gingerbread Houses.